King of Iraq (1935-1958). Autograph letter signed. Baghdad. 8vo. 1½ pp. 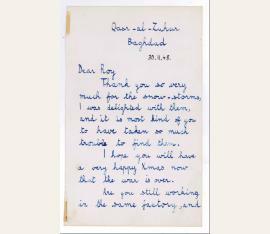 Rare, early autograph letter by the ten-year-old Faisal to Roy (i. e. F. Roy Deeley, a collector of autographs): "Thank you so very much for the snow-storms, I was delighted with them, and it is most kind of you to have taken so much trouble to find them. 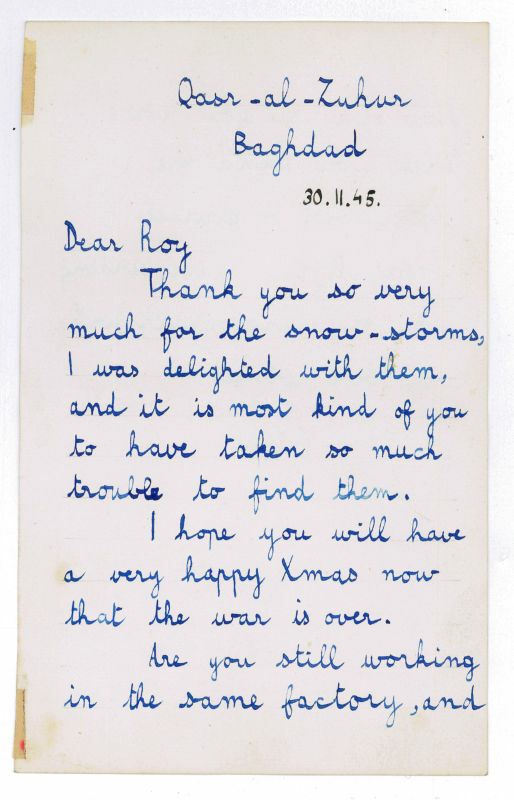 I hope you will have a very happy Xmas now that the war is over. Are you still working in the same factory, and how old are you now? Will you send me a snap-shot of yourself some time [...]". - A couple of very light, minor stains to the left edge, not affecting the text or signature.